In astrophysics, an area of interest is Bondi-Hoyle-Lyttleton accretion, which is fluid flow onto a compact object. This typically simulates the accretion of a gas onto a dense object. It is interesting to extend this to accretion onto black holes, and to investigate the dependence of the flow field on the upstream velocity, the spin of the black hole, and any perturbations in the upstream fluid density. Overture allowed us to use overlapping grids to capture both the outer spatial boundary and the black hole horizon with smooth numerical boundaries. We are interested in simulating the accretion of interstellar gas onto a black hole. We conjecture that the properties of the resulting flow may depend on the properties of the black hole, and would therefore allow these to be deduced given observations of a gas flowing onto a compact object. The main challenge is that, in order to allow a wide range of parameters, we need to allow for fully three dimensional phenomena. This then requires a significant amount of computational effort to simulate, and we seek to reduce this as far as possible. There are two important boundaries which need to be captured. The first is inside the black hole itself. Physically, no information can propagate out of a black hole (at least according to classical General Relativity) and, so long as the numerical methods obey the same restriction, more-or-less any boundary condition can be used inside the black hole horizon, and in fact we would like to excise all computational cells inside the black hole. The second boundary is the outer boundary. This should be located as far from the black hole as possible so that we can assume that the far-field lies in a flat region of space. This latter requirement means that a Cartesian mesh is not suitable, as it would require a large number of cells to reach a large spatial distance. 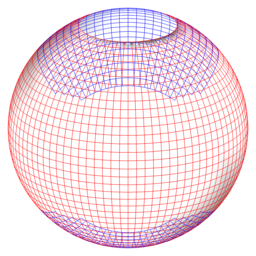 A more suitable mesh would therefore be a spherical one. This will allow smooth outer and inner boundaries, and a reasonable number of cells to gain a sufficiently distant outer boundary. We made use of the Overture package developed by Henshaw et al. which supports overlapping, curvilinear meshes. This allowed us to use spherical meshes without having to use very small cells. An example mesh is shown to the right. We performed a parameter study that included the variation of the black hole's spin, the angle of the incoming fluid flow to the black hole's spin axis, and whether the fluid included a density perturbation. 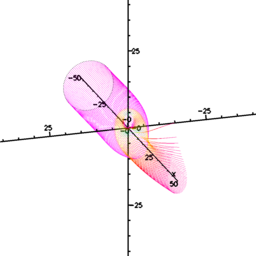 To the left we show streamlines from flow onto a black hole with spin 0.9 with a density-perturbed flow upstream. Results from the full parametric study can be viewed on the University's DSpace site.